Menbur brings us 09571/01 CALAMIA. The classic black slingback gets a stylish makeover with this striking shoe from Menbur. The upper is made from a soft nubuck like textile and there is a soft textile lining. The heel is the stand out feature of this shoe with gold metallic and jewel like detailing. There is an adjustable buckle fastening on the heel strap to ensure a good fit. The gold detailing on the heel is echoed in the buckle fastening and small flamingo decoration on the outside of the shoe. The heel height measures approximately 2.5 cm. Perfect as an alternative to high heels for a night out when paired with a cocktail dress or give your work wardrobe an injection of style by wearing these with cropped black trousers and a white blouse. 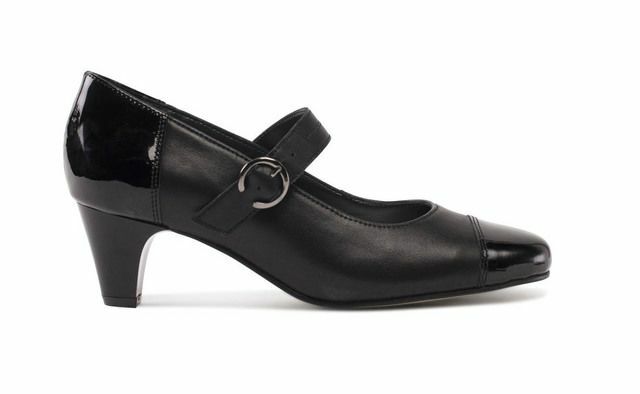 Buy your Menbur ladies court shoes form Begg Shoes, an official Menbur stockist.